I have a short list of favorite words that consistently make me smile. For instance, I think "kerfuffle" is a perfect way to describe a little scuffle or disagreement. I have a friend who makes me laugh every time she says "thimble" because she thinks that word gives everyone a lisp. I also love the word "unflappable." Not only is it a fun word to say, but the calm, cool, and collected image that the word conveys is exactly how I want to be. I like the idea of being composed and utterly unshakeable because I think that's the best way to make good decisions when trouble arises. (Of course, I'm NOT this way nearly often enough, but I think it's healthy to have aspiration goals, ya know?) There's nothing worse than that feeling of either panic or paralysis when things get tough. 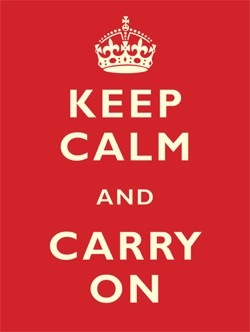 Perhaps that's why I love the British ads from World War II that encouraged British citizens during the bombing of London to "Keep Calm & Carry On." Not only is the design simple and timeless, the message is appropriate no matter the era. I think about it this way; if the English could buck up, "keep calm & carry on" while bombs were falling, I should be able to do the same when I hit a frustrating situation in my significantly more humble situations. I'd love to keep a kind of confidence that, no matter what chaos the day holds, allows me to stay calm and "carry on." A few days ago, I learned the background on this poster and hearing the story makes me love the image even more. This message has been held like a letter in a bottle for 50 years. See for yourself. Enjoy the story. What does this phrase say to you? How does it apply to your life, home, work, or relationships? As the narrator says, the idea is something that should never fade from fashion. You may call the idea "staying calm"... but I might just keep using the word "unflappable." Awareness Precedes Choice. Choice Precedes Change.